I don’t normally do anything in January, except recover from the excess of Xmas, but Nas decided to arrange something. 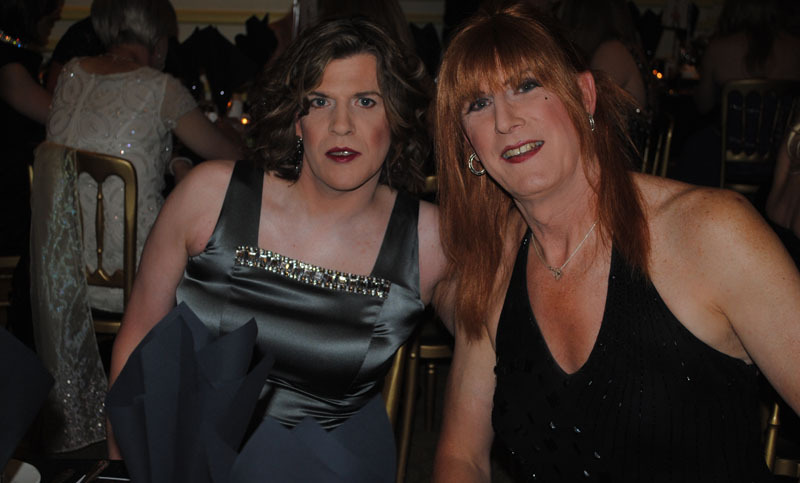 A couple of friends of hers had taken to a pub in Stratford which had a drag show in it. Nas thought it was really good and decided to arrange an outing. We decided to go to see the show on a Friday night rather than the Sunday afternoon, so having left work, I rushed home shaved and packed my bag before driving around to Nas’s house. As the pub was in the middle of Stratford, I decided that a posh frock was not the order of the day, at one point I did consider wearing jeans, but changed to a short skirt, boots and opaque tights. We also agreed that fairly casual hair was in order so; it was just a case of running the straightners through few a couple of times and then running my hands through it. There was going to be a few of us going along, but unfortunately most dropped out on the day, so it was just Nas and I that went along. Nas adopted her usual driving technique, i.e. drive as fast as possible then we will make it up on the way as to where we were actually going, unfortunately the technique did not work this time and we got lost and ended up doing various laps of Stratford shopping centre. With the Olympics arriving shortly Stratford is a building site these days and although it was nice to see the various sites, it was not high on my list of site seeing tours. Eventually after several laps of the one way system we managed to find the pub, and luckily found a parking space just outside, the pub was in a quiet street with nobody about, so did not have to practice my ladylike exit from the car. Unfortunately as we got to the door and enquired about the show, we were told that there was no show tonight just Karaoke. Well I must admit I hate Karaoke, but as we were out and I was dressed up we decided to go in for a while. Next thing I noticed was that I was the only TV in the pub, so I got a few stares, I thought I might get a few people chatting me up but that did not happen. Nas and I found a spot near the bar, but as the night out coincided with my non drinking month we both indulged in a few glasses of coke. There was a drag queen who was in charge of compairing the Karaoke, but other than announce the next song she did not do anything else. Most of the singers were dreadful, but every so often there was a person who was half reasonable, but don’t think any of them would challenge the dancing dog on the x factor. Whilst I remained at the bar Nas did a bit of net working for her business. As the night went on a one or two people did come over and speak to us and they were very friendly, but they could not persuade us to try Karaoke. After a few more drinks it was time to go home. Nas said she enjoyed it and would be going back at a later date, but for me it was a one off visit. I set off for Clare’s this entailed driving around the M25, which is a road I really hate, on this day . it was pretty much plain sailing, but the weather was closing in and the further West I went the blacker it became until eventually the heavens opened and it hammered down with rain. Eventually I came to my turn off junction on the M25 and the stat nav did its job in guiding me directly to Clare’s house. I managed to park up directly outside her house and lugged my bag into the house. The first outfit was a mauve/plumb coloured knee length and matching shoes, which I had purchased a year or so back on one of my shopping trips with Nas. I had got the dress and shoes from Phase Eight and it’s one of my most comfortable dresses. In addition to the dress I had flesh coloured tights and silver jewellery. 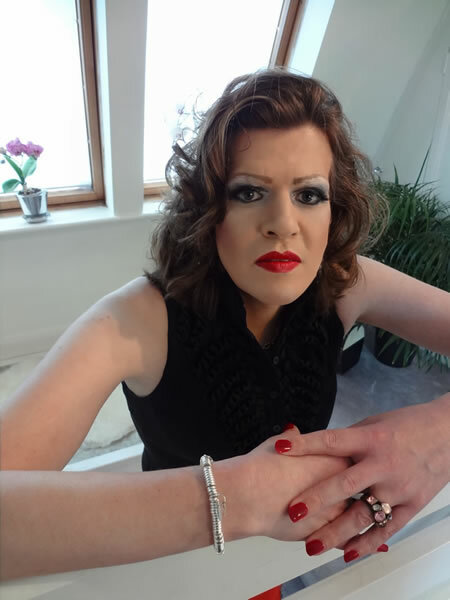 It was then time to change into the second outfit, we kept the hair the same, and touched up the make up before making a quite change into a short turquoise dress with silver shoes. The dress was thigh length and was a one shoulder number, I had gotten this from Warehouse a few years back, but it had only had one or two outings. The next outfit was a French maids uniform. It was one of those with an indecently short dress, with a petticoat that pushed the dress outwards and upwards. Any movement in the dress immediately meant that the tops of the seamed stockings were showing and if I bent down much more was visible. Again we started with the pictures sitting on the balcony, before Clare managed to find a feather duster and took some pictures of me dusting on the balcony. The final outfit was the end of session, underwear shot. As my stomach has been expanding at a rapid rate, I wanted to try and the usual avoid bra and knickers pictures and instead went for a corset. It was an old fashion 50s style corset, which was very tight and restricting, it was pretty difficult to get into, but did not have hook and eyes or ties to do up. The corset was mainly black with a couple of bright red parts and teamed this up with black knickers and stockings. We also added some diamante earrings, necklaces and bracelets to finish the look. 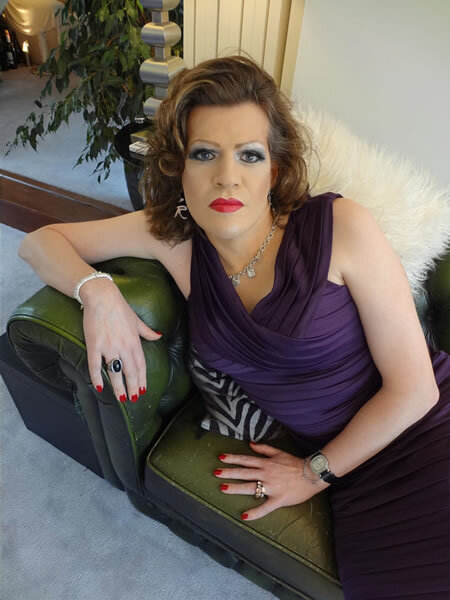 After the final pictures were taken, I had a quick drink before removing the make up, changing and then getting back into my car and heading back round the M25. The journey home was much easier as it had stopped raining. 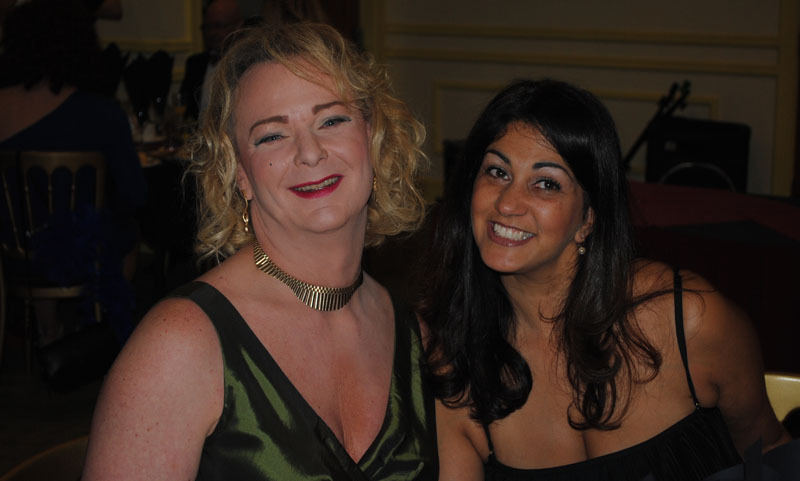 Whilst looking on facebook Nas found details of a Ball which was taking place in Leeds, as it had been a while since I put on a posh dress I jumped at the chance of going. The Ball was being organised by a called the Leeds First Friday Group, which is a group of Leeds based TV’s that meet up on the first Friday of every month, I believe they usually meet in a hotel in central Leeds and then go out to the various clubs, this was going to be their first attempt at a Ball. Nas had given us plenty of notice regarding the Ball and so I had made arrangements with the girls at Crème to find a dress for the Ball. I had a dress in my mind which was going to be long and black, but having spoken to the girls at Crème that did not have many Ball type dresses in stock. Nevertheless they did keep a couple to one side and when I went along I had the choice between two red dresses, a grey one, a black one and a multi coloured one. Unfortunately two of the dresses did not fit, and one I did not like. So I had a straight choice between the grey and red one, after trying on both the dresses again and walking round the shop we all agreed that the Grey one was best. At a later date I also indulged in a new pair of shoes which were black, but for a change were actually open toed. Nas had managed to get two others Rebecca and Tess interested in attending the ball and as we all lived fairly close to each other we decided to go up in one car. I drove around to Rebecca’s early in the morning and we set off to Tess’s. It’s quite a short journey, but unfortunately we got caught up behind a horse drawn funeral possession, and instead of a twenty minute journey it took almost an hour to get there. Once at Tess’s we repacked the bags and set off up the motorway, I had managed to get in the back seat of the car and tried to sleep some of the way, but as our journey was so disrupted due to the heavy rain I could not fall asleep. As we got close to Leeds Tess was telling us about all the time she spent in Leeds as a student and was trying to see if there were any familiar landmarks, as her time in Leeds was over 30 years ago, we did not see anything she recognised. Rebecca’s natural sense of direction got us to the hotel, and there was another downpour commenced just as we unpacked our bags from the car, but the hotel was only about 100 yards from the car park so we did not get to wet. We checked in quite quickly, Rebecca and I were sharing a room, which was quite spacious and airy and was overlooking the front of the hotel. After unpacking we met down in the bar for a quick beer and a sandwich. Having spoken to the event organiser a few weeks earlier I had arranged a hair appointment in a salon which was meant to be fairly close to the hotel, actually as we walked in it we passed the salon so it was only about 30 metres from the hotel. As the salon was so close both Tess and Rebecca decided to try and get appointments which they both managed, so whilst they were getting their hair done I relaxed on my bed and waited for Nas’s arrival. As Nas had to leave early the next morning she decided to drive up in her own car, and normally her lead footed driving would have meant she would have flown past us on the motorway, even though we had a two hour head start on her. This time however all the rain that affected us on our journey had a knock on effect on her and she was caught in traffic which meant that all our makeup slots were going to be at least one hour late. A one point whilst looking out of my room window I saw Nas’s drive past, but was unable to reach her on the phone and it was another 30 minutes before she arrived, by which time I was at the salon next door. 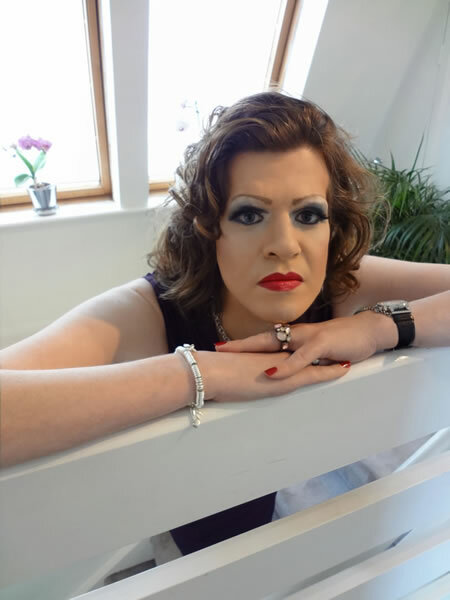 It was only a small salon, but was pretty busy, I asked for my hair to be curled and I had a little Italian guy do it, he was pretty good and I was only charged £10 for it which was a real bargain. Once back in the hotel, I again had time to sit about and wait for Nas to finish the other gurls make up, before I sat in the chair. Nas was her usual chatty self explaining the problems that she had on the way up to Leeds together with her daughters and cats latest adventures. As we were running behind schedule she actually finished my make up quite quickly, although we had a bit of a disagreement about how pale and pasty I looked. Eventually Nas agreed with me and a bit more bronzer was applied before I went off to my room to get ready. I had two dresses with me and had decided not to wear my new dress, but to stick with my favourite LBD, I got all my clothes together and went into the bathroom to get ready. Too much beer and not enough has resulted in my expanding waistline, but on this night my stomach did not look to bad so the magic knickers were not required, and I even managed to get my stockings on without any ladders. I got my dress on and everything was looking good, but then disaster struck the zip on my dress broke and I could not close it. The zip had come away t the bottom and as I pulled it up there was a massive gap at the bottom, luckily had another dress with me so I switched to my second dress. The new dress fitted fine and I only had to make a few jewellery adjustments before I was ready. As we thought we were running really late Tess and Rebecca had already gone down to the reception area, but as I met them downstairs it turned out that the whole event was running late so I was able to join them in having a glass of champagne before moving to our dinner table. Nas must have applied her own make up super fast as she was also able to get down in time for a glass of champagne. There were about 8 tables set out for dinner and every place had your name and picture on it together with details of the food that you had ordered (for the forgetful ones). There were two other couples on our table and I was next to a couple who ran their own jewellery business. The food was actually very good which is unusual in these big events, the wine was ok, but not free flowing so Tess and I went to replenish our supply. Once the food was over it got a bit confusing as there was meant to be a live band, but unfortunately there van had broken down on the way and although they were hopeful of getting there we did not know how long the delay would be. Whilst waiting for the band everyone went to the bar area where the raffle took place, Tess and I were both winners in the raffle. Tess managed to win a bubble gum machine whereas I won a meal at the hotel in Leeds. We stayed in the bar area for a drink and by this time the band had arrived and were ready to go. The band were ok we listened to them for a couple, but then decided we would move back to bar area, by this Nas had gone off to bed. Earlier in the night we had met a girl Deborah who used to attend some of the Boudoir events before she moved away, so we settled in the bar with her, and she was telling us what the Leeds girls usually get up to and the various bars nearby, and they planned on doing the same again tonight. It all sounded good, but having travelled up that day we were all very tired, and besides none of us had a change of clothes and our posh party dresses weren’t really clubbing attire. We decided to switch from the wine to the spirits and have one more drink before heading off to bed about 2am. As Tess needed to be home to visit her mother we got up fairly early the next morning and decided to have a bit of a walk and get some breakfast. We found a nice little place and indulged in coffee and various other stuff to keep us going. On the walk back to the hotel we did manage to find a pub where Tess spent many of her university nights. When then took a slow walk back to the hotel checked out and got in the car for the journey home which was much quicker as it was not pouring with rain.